Christina Rogers, an automotive reporter with The Wall Street Journal’s Detroit bureau, begins her piece at a Nissan dealer near Atlanta where the Nissan Leaf has been a "big seller over the past three years thanks to its low monthly lease price." "There is really no incentive to buy a used one when you can lease a new one for less," states the owner of the dealership. 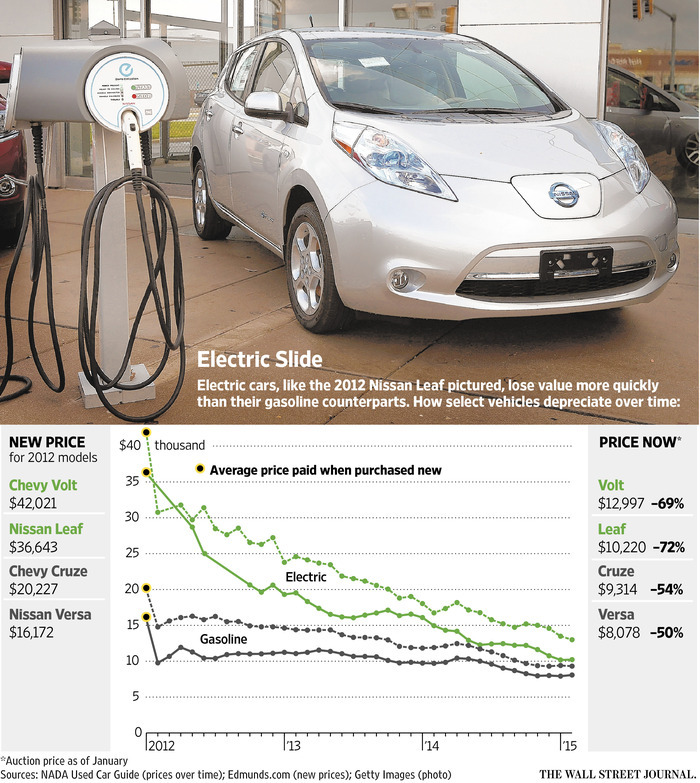 Another contributor to rapid depreciation are low gas prices that reduces demand for EVs. Lowering demand for used EVs is concern that "the expensive batteries could have to be replaced," writes Rogers. The Leaf and the Chevrolet Volt are hardly the only EVs seeing low demand for used vehicles. Other electric cars, including plug-in versions of Ford Motor Co.’s Focus and Toyota Motor Corp.’s Prius, are depreciating as fast as the Leaf with the average trade-in value in 2014 falling between 22% and 35%, depending on model, according to the National Automobile Dealers Association (NADA)’s Used Car Guide. The exception, as one might expect, is Tesla's "Model S, a luxury electric sedan whose lower sales volume helps it retain its value better," writes Rogers. "NADA calculates a 2013 Model S this year is worth 71% of its original price, compared with 44% for a Leaf and 39% for a Volt." See the WSJ graph showing the faster depreciation rates for the Chevy Volt and Nissan Leaf compared with the Chevy Cruz and Nissan Versa. Of course, for those in the market for used EVs, there are many deals to be had, and Rogers describes the boon for those consumers.